Christmas update is now available for GTA 5 Online. If you log into the game you will probably notice a Christmas tree that is in your apartment. The tree is not the only change in this event. There is a new vehicle and cool outfits to enhance your Christmas performance in GTA Online. We'll show you what's new in the game. 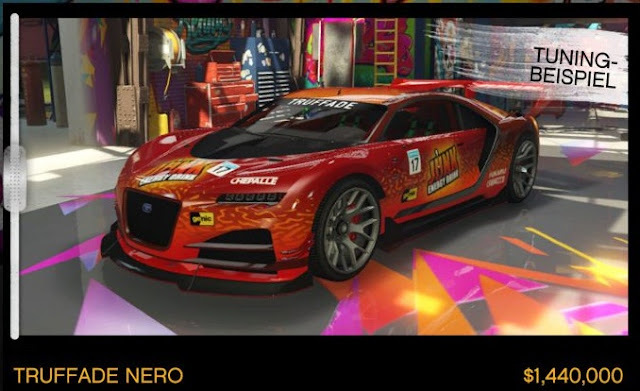 In Benny's workshop, you can now buy the Truffade Nero for 1.440.000 GTA $. The Nero you could see on the Leak of the 9 unpublished vehicles in GTA 5 Online. There you can also see which vehicles will probably appear in the import / export DLC. At Binco you can pick up interesting clothing items free of charge. You can make your Christmas mood with nice-looking sweaters or other garments. In addition to worn out Santa Claus outfits, there are also tops that look even good. A visit to Binco is worthwhile. Attractive outfits are another highlight in this shop. However, these are not free, but have high prices. You get these bodysuits for 100,000 GTA $ each. However, the attention in this outfit is almost guaranteed. GTA 5 Online: Snow 2016? One of the biggest wishes of the GTA 5 online community is probably the snow on the streets in the game. Last year Rockstar released this feature at Christmas time. This year, too, there will be snow again, which is allegedly sources in the GTA forums, which have already announced unpublished content. It is said that the snow will be released on 24 December. But this is only speculation. An official message from Rockstar is not yet available.